Sperm abnormalities noted in Florida panthers include partial mid-piece aplasia (left) and tightly coiled tails (right). 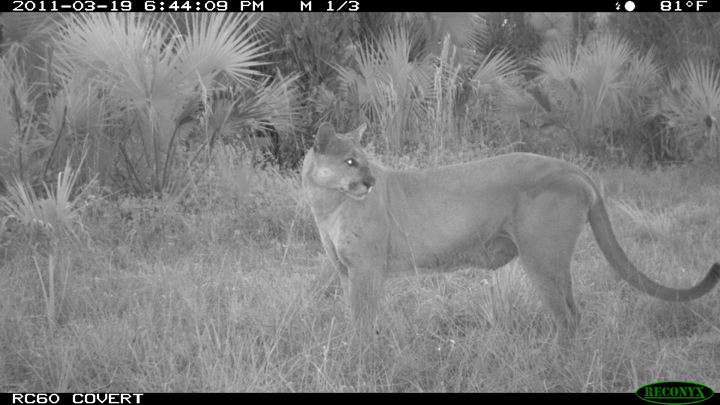 One of the first clues that helped FWC panther researchers conclude the remnant population of Florida panthers was in peril over 30 years ago was the preponderance of so-called correlates of inbreeding depression. Among these were several that could directly impact the fitness of individuals, hence increasing the probability of extinction of this endangered animal. Of particular note were attributes of the male reproductive system documented in the 1980s and early 1990s that revealed panthers had the poorest sperm quality (see photo above) of any wild felid at that time. Males were also frequently unilaterally or in some cases bilaterally cryptorchid, the latter being effectively sterile. 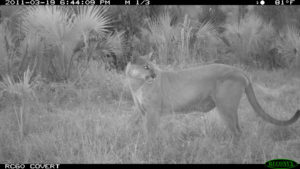 These early findings played an important role in the decision making process to implement the genetic introgression program in 1995, which involved the temporary release of eight female pumas from Texas into the wilds of south Florida to mimic historic gene flow. Male Florida panther in the Picayune Strand State Forest east of Naples, Florida. FWC staff and collaborators at SEZARC have examined male reproductive characteristics from >200 panthers since 2000. Genetic introgression had a significant impact on improving male reproductive performance. For instance, in the ensuing 15 years, only 10 percent of male panthers examined were cryptorchid in comparison to 66 percent during the pre-introgression period. Staff continue to collaborate with Dr. Linda Penfold at the Southeast Zoo Alliance for Reproduction and Conservation (SEZARC) on male panther reproduction research. Staff collect testicles during necropsy and ship them to Dr. Penfold’s lab where sperm quality and quantity analyses are conducted. In some cases, sperm has been banked, something that could prove useful for genetic management of the population. The long term data we have originate from a period when the population was undergoing a severe bottleneck through a stage of population expansion. These data provide us with valuable information to assist with making informed decisions regarding the implementation of future genetic introgression programs should they be warranted.